It’s been over a month, but it feels like London Fashion Week 2018 was just yesterday. In February, the city once again flourished among the buzz of innovation and a collective eagerness to see what designers from across the globe had been busy fashioning for their AW18 shows and presentations. Pear Chimma and I delved into the thrill of the week at the BFC Show Space to find fresh, exciting collections from contemporary designers. 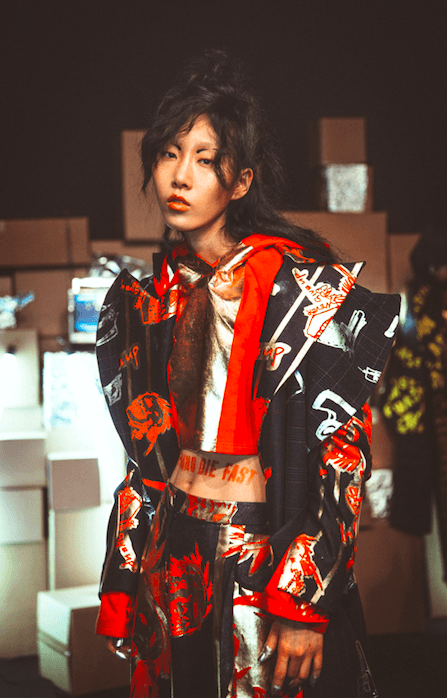 This season, themes of social narrative and activism dominated the runway, with a number of designers choosing to use their collections to fuel debate on what it is to live in the modern society, as well as exploring stories from around the world. Designer duo Teatum Jones guided the audience through an arrestingly beautiful narrative with their Global Womanhood collection, exploring the incredibly diverse and intimate stories of women internationally, asking what it is to be a woman in the modern age. The show was highly poignant, interweaving an emotionally intimate short film throughout the show that explored moving stories of joy, sadness and hope from women of many backgrounds. London-based brand Zu Xhi exhibited their highly texturised collection, diving into the romantic relationship between designer Jane Morris and 19th century painter and poet Dante Gabriel Rossetti. The line honoured a unity between man and woman in an era where gender equality activism is more prominent than ever. UNDERAGE launched Riots of Our Own, narrating issues surrounding identity and the current political climate through homage to the rebellious reformers of 70s punk, shown through the sharp angles and rebellious text of pieces worn by models whose eyes shone with fierce challenge. Similarly, the collection exhibited by Paul Costelloe was classically refined collection reflecting Irish heritage and an eagerness to explore identity and diversity. Overall, this season saw exploration of self and society taking a forefront in designer collections, igniting a strong narrative on the modern day. Take a look at some pictures below and see for yourself.